Why do we call ourselves experts at Texas Traditions Roofing? It’s because our inspectors are Haag Certified. We can pinpoint storm damage more accurately than other roofing contractors due to our extensive training. If you need storm damage roof repair, let us inspect your roof and provide you with a comprehensive free estimate. In some cases, after a storm, roof damage is obvious from the ground. You may see missing shingles or large dents in shingles and gutters. You might have already detected a roof leak due to water inside your home. In other cases, damages are not obvious or visible from the ground. That’s when a professional roofing inspection by a Haag Certified roofing contractor benefits you. You only have a limited time to file an insurance claim after a storm. If damage isn’t obvious or hasn’t yet resulted in a roof leak, this doesn’t mean it’s not there. You need one of the experts at Texas Traditions Roofing to get up on your roof and inspect for damage. Should we determine you have damage and your insurance company denies your claim, we’ll meet with you and your adjuster to demonstrate why your storm damage roof repair should be covered by your insurance policy. Your roof is your home’s first line of defense against the elements, protecting your loved ones and property. But sometimes even the toughest roofs can’t stand up to Mother Nature. 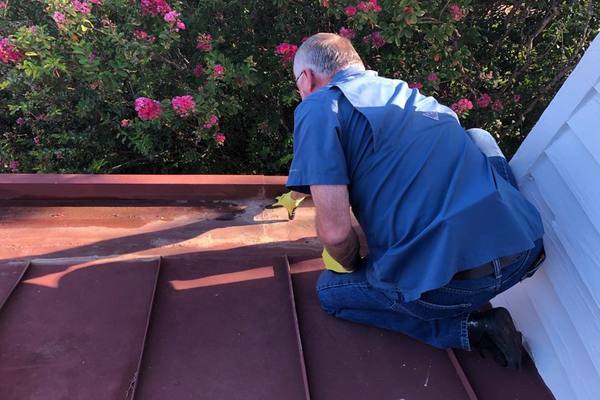 It can be upsetting and frustrating to experience leaks or other roof issues following a severe storm. In many cases, your insurance company will cover the costs for repairs and/or replacement of your damaged roof. The team at Texas Traditions Roofing will make the process as smooth and as stress-free as possible. Contact us today by calling (512) 415-4590 or filling out our contact form to request a no-cost inspection.